I was recently both elated and horrified after a family friend took a nostalgia trip to our old neighborhood in Oak Lawn, Illinois. She took photos of the houses where we grew up. I had not seen my happy childhood home since my last pilgrimage to the old homestead when I visited Chicago in 1988. Elation came from the flood of happy memories. As she embarked on this visit, Arlene said that the happiest times in her life were spent in our old neighborhood. Same here. I was blessed with a childhood full of love, friendship and security. Horror came from how much the house and property had changed—and from a fear that I might never again know the level of happiness I experienced in and around that little brick home in a newly developing suburb of Chicago where I lived with my family from ages three to twelve. I have touched that joy at other times. But what if I could really “live there” for good? I’m overall a happy and upbeat person, thanks to that sweet upbringing. What I felt there was nothing short of a sense that the whole world supported me, that the worst thing I ever had to heal from was a spat with a neighbor kid or a relative that somehow always got smoothed over in the end. It was a time of innocence and magic … and seeing how the physical house and neighborhood has changed was a visual metaphor for how time changes us all. These memories sent me on a mission to define what it was about my childhood that contributed to the formula for such happiness. What a wonderful process for anyone whose 4th House is about to be visited by Jupiter, a transit that at its best could support the recreation of a joyful childhood. Anyone can walk down memory lane and take notes from your older, wiser self on what made you happy—and what didn’t. Because even if your childhood wasn’t a walk in the park, revisiting it while Jupiter is transiting your 4th House or aspecting your Moon can also help you uncover or rediscover your own formula for happiness. Identifying what didn’t work and what was lacking is a back door into rebirthing your happy, inner child. We learn continually in life from those who show us what to do—and those show us what not to do. One of my favorite quotes is by author Tom Robbins,“It’s never too late to have a happy childhood.” My visit to mine is an invitation and encouragement to you to find your happy childhood, whether or not you had one in the first place. How I could recreate what I had there? For starters, I’d have to figure out in detail what really led to that sense of joy, security and support. Second, I’d have to recognize that childhood and the wisdom years are not the same thing, that I may not be able to reconstruct an exact parallel. We never again get a pass on things like making a living and the other big responsibilities we get to avoid, usually only once in a lifetime, as children. Still, I’m at the age where I have developed the skills to create my own reality. As I’ve also been anticipating a move within the year from my current, beloved house of sixteen years to one that’s more accessible for my husband’s mobility issues, I need to be clear on what makes a house a happy home. The quest feels urgent to help me let go of one home and to embrace another. I really get it’s not the house that makes us happy, it’s how we create a home from the love, memories, rituals and other “stews” of life that bubble in the background of the place we call home. These ingredients are portable. Now to reconstruct my parents’ amazing recipe. The way Oak Lawn went all out for this event with celebrities like Roy Rogers and Dale Evans appearing in the parade on horseback with other heroes, local and national, it’s no wonder I was destined someday to move to California. The dye was cast for me to catch the same pioneering spirit behind the Westward Ho Movement that preceded me by a century, re-enacted at the Round-Up once every formative year. 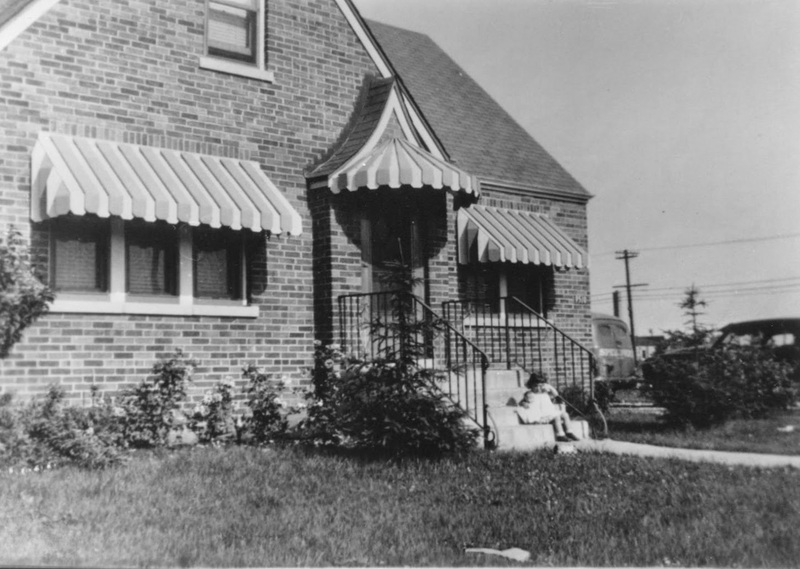 Because it was a safe neighborhood during the era of Father Knows Best and Ozzie and Harriet, my mom felt comfortable letting me roam around and play without checking on me more than every couple of hours. This was heaven on earth to a Sun square Uranus. I felt so free. My earliest memories were of openness. I was the oldest kid in the neighborhood at first. I felt like the queen of this vast kingdom. In fact, the bus driver dropped me off last so I had to waste time riding the entire route. The dangers my mother worried about were very diffuse (Neptune square Moon). They were something she never really explained. While I was free to roam within our block and a bit beyond, I was stymied to go further until I was much older. I was always pushing the limit, and Mom was never generous with her comfort zone. Our double lot and block were a wide turf to me till I reached school age. They started to shrink in vastness as I grew taller. They felt more confining. Saturn in the 4th. This rocked my world and my being to the core. I’m not sure I’ve ever completely recovered from the shock. Perhaps it’s also an expression of Uranus square Sun; a child who grows up living with and living through a shocking experience. But I “got” right away that we were not supposed to talk about it—or they would have already. We talked endlessly about everything else. After a couple of months of 24/7 ruminating (I’m sure I even dreamt about it), I eventually intuited that my parents didn’t want to talk about my adoption for fear it would change things between us in some essential way. I kept my knowledge of that dark secret about myself until I was eighteen—for the next ten years. It was the shadow of my childhood. Despite the gnawing secret of my adoption—I’d identify its root of original abandonment much later in life as my Chironic wound—there was so much good that compensated for it and made my childhood otherwise happy. Here are some of the major ingredients I discovered about what made my home happy. There for me. What I had as a child might be difficult to recreate in families today where two incomes are often essential and life is so much more complicated. I had a stay-at-home mom till I was twelve. My parents were always there for me. I had a baby sitter once or twice in my life, and I’m sure it was for very good reasons and only a close family friend. I could count on my Mom and Dad without question. I know the sense of someone being there for you is what we all crave, but in my case, it was literal. That had its shadow, too. I was a bit too sheltered. are my foster sisters who stayed forever. Hot Dog! An open door—and open hearts. Our house had a huge welcome mat. Can’t say I remember the literal one, but the figurative one must have taken up a block or two. My parents took in strays—foster children, friends’ kids who were in trouble, their own son/my much older brother whenever he was in his latest jam. They had hearts as big as all outdoors, as big as I felt my neighborhood kingdom was for me when I was little. They were the soul of Neptunian compassion. I could always expect kindness at home and empathy to others’ problems and concerns. My parents had a deep commitment to making as many people happy as possible, and they succeeded by leaving those people still feeling their kindness and warmth long after they were gone. A sense of belonging. It says a lot that I felt such belonging; it was a shock to learn that Mom and Dad weren’t my biological parents. The other thing it taught me is that you don’t have to be kin to “feel a part of.” Mom and Dad did such a good job; it wasn’t until my late twenties that I realized the essential differences between my adoptive family and me. The differences mostly had to do with culture and interests. I was “naturally wired” to love literature, writing, the arts, etc. Mom and Dad were not interested in these things and barely kept Reader’s Digest and the newspaper in the house, though they greatly encouraged my education from that ‘50s desire to give your children more than you had. Within my adoptive family, I was the first person to go to college. I was a white collar kid growing up in a blue collar family, but it really never mattered since they still gave me the space to bloom into the flower I am. My own room, time and space. I didn’t have to share a bedroom most of my childhood. I had no idea until I grew up the importance of this “personal space” in supporting my essence as a Uranus square Sun individual. My blonde youth bed was special ordered for me, and it starred in my favorite Taurus Rising food fantasy. I had seen on TV the automats in New York, a series of windows and compartments where a person could open any glass door and choose whatever food they wanted. I imagined an automat in my youth bed headboard, where I could have my favorite comfort foods pop out at the press of a button: chicken soup with buttered saltines for dunking, fresh corn on the cob, cherry pie … (Stop me before my Weight Watchers compliance is as far off as my youth.) I used to love to read in my room and explore the “cubby hole” in my closet, a storage space that opened via a tacked-on aluminum flap. There I found my grandfather’s notary public seal, one of the first Brownie box cameras owned in my extended family and other memorabilia in cardboard boxes, treasured only for their sentimental value. (This is probably the genesis of my “Fibber McGee’s” closet and packrat tendencies, though I’d later learn they were also genetic from my birth family.) My personal childhood space was an incubator for learning, learning to think and exploring mysteries (Jupiter in Scorpio). A positive attitude toward progress and technology. My parents were gismo junkies. They were always interested in finding and trying a better mousetrap. They were the first to buy the fancy Princess telephones or to deck the house out in light turquoise and yellow fiberglass awnings, which on reflection looked cheesy, even if they kept out the hot summer sun. I’m sure we were the first on the block with color TV, and our TV sets themselves always pushed the limits of what we could afford. This set a tone that’s with me still today. I’m not afraid of what’s next when it comes to conveniences, and I value how they make life work better. This, in fact, has been a yummy leftover of the happiness pie for me as a baby boomer, needing to embrace fast-paced technology to do what I do and even, as Bill Maher recently said, “to be in the conversation.” I’m not techno-phobic like some people in my age group. Close friendships. My parents had many friends, but a few close friends who were regarded as family. Arlene, at the beginning of this story, was one of the two daughters of their best friends, Mick and June Clegg. Aunt June and Uncle Mick’s other daughter, Theresa, was my best friend growing up. Theresa and I were the same age, born only six months apart. Sons Mike, Marty and Billy rounded out the Clegg family of five that extended our own by that many. Mom and Dad modeled how to be great friends, one of their gifts to me that keeps on giving. The one thing I could never live without are my friends. Pets as Family. I could regale you for hours with “tails” of our four-leggers. 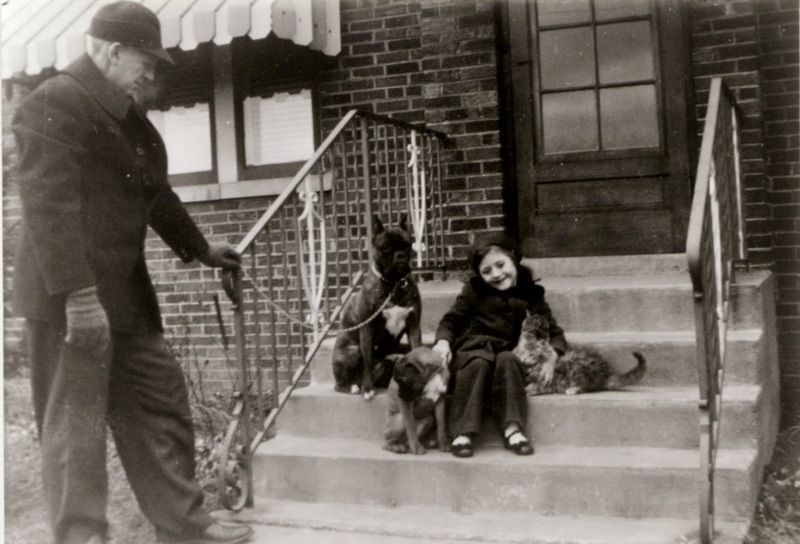 I grew up primarily with boxer dogs, the veterans named Duchess and Lady, shown in the opening photo. I could write a book alone about Duchess who was stolen and returned to us and who liked to visit the local bus garage, about three blocks away across a dangerously busy street. The bus drivers would give her ice cream. She looked very Taurus, so I’m sure this is why no screen door could contain her from her periodic treat-seeking excursions. The love of animals and regarding them as family members is another indelible ingredient of my happiness—still. Photos from family albums except for the family home in 2014 by Arlene Clegg Johnson. Next, Part 2 – The rest of the ingredients, what didn’t work, the impact of moving and the proverbial question, can you go home again? Another reason nostalgia trips help me get focused is that I have Mars in Cancer. It might work for you, too, if your Mars is in this sign or you have other personal planets in aspect to your Moon natally. Oak Lawn 100 Years: A Century of Growth, p. 88. I attribute the compatibility and cohesion I had with my parents in large part to the exact sextile formed by their Suns with mine at the midpoint: Dad's Sun at 29 Leo, mine at 29 Virgo and Mom's at 29 Libra. I really felt like I was the center of their lives. I read this biography with rapt attention on every word, it was so fasinating. Like you, I have a Taurus Ascendant with Pluto in Leo in 4th House. So I very much enjoyed your analysis of the broad themes of your childhood and the shape of your life. Though I know myself very well, I could not write so eloquently about my own chart in this way. Lana, thanks for your support and encouragement, not only on this post but on many other posts and projects. I love the reminder that we have these chart similarities. Lately, I've been feeling drawn back to my memoir, a project I completed and later realized I want to redirect. I actually won an award in 2005 at the Yosemite Writers' Conference for a mini-proposal of it. It encourages me to know that you like my biographical writings. It's especially fun to write memoir with an Astro-spin to those who speak the "lingua astro."